Once you saw the art for your season, did it cause you to see your haiku in a different light? Poet Anastassia Cafatti Mac-Niven: No, it didn’t do any difference to my haiku. But now that I think about it, the art suits my haiku because it has something to do with death, and the haiku I did shows pain, and a feeling of death. Once you saw the haiku for your season, did it cause you to see your art in a different light? Artist Caleb Brown: Oh yes, of course! One of the things that I like about working with other people on creative collaborations is that you can’t predict what your partners will bring and you can’t rely on your piece of the project to deliver the whole “message”. That means there’s sometimes some surprises and reevaluations of your own content. 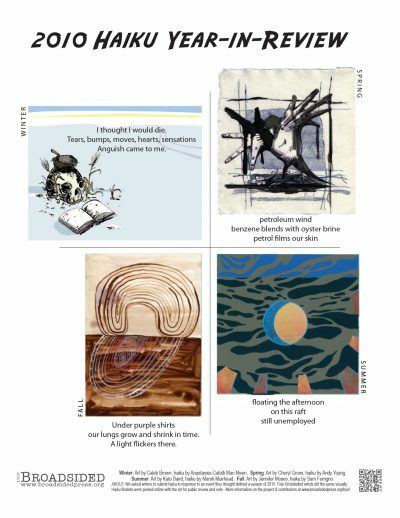 How do you think the four art/haiku combinations create a conversation about 2010? Poet Anastassia Cafatti Mac-Niven: The four art/haiku combinations create a conversation about the 2010 because of all the bad moments, and tragedies we have passed through like the earthquake in Chile, and the torrential rains in New England. Also, another conversation might be how fast things come and go, and the consequences, sadness or happiness they leave. Lastly, the problems human beings give to the nature and the world. Artist Caleb Brown: It’s interesting, I guess the conversation that is created becomes less about specific events and more about a “feeling” that transcends the events. At least in the case of “Winter” where Anasatassia and I contributed work about different events—but actually I see that’s true for all the seasons except Spring. Which is good, it’s exciting to compare both kinds of conversations. For me, I found myself looking at the parts of my drawing and looking for ways that they were “talking” to the haiku words. In “Winter” there’s some wonderful correspondences, for instance, between the skull and “death” and “anguish”… But there’s also the possibility that things aren’t as bleak as they seem: the speaker in the poem only “thought” she would die, and the skull in my picture is surmounted by a nest with a literate, oblivious bird. The stalks of rye in the field suggests that growth will return. Taken all together, I love the embodied quality “Winter” generates, as a combined work. It turned out to be tactile, but also sort of non-specific. Why did this event inspire you? Poet Anastassia Cafatti Mac-Niven: This event inspired me because the earthquake, instead of moving the floor it moved my life. I got really scared and had awful sensations in the moment. My Haiku represents what I felt…. and what many other people felt. Artist Caleb Brown: First, I am a big Salinger fan, and I went back and reread some of the tributes to him upon his death in the New Yorker and in other places. So that was one input. This may sound odd, but once I had the notion of doing art about one dead person, I also looked on Wikipedia at lists of other people who had died in the winter of 2010. On that list was 15-year-old Phoebe Prince, a young woman who committed suicide as a response (in large part) to the extreme bullying she received at school. This was a major news happening in Massachusetts where I live, and as a former teacher and current father, I had a strong reaction. So for different reasons, both Salinger and Prince, along with their troubled histories and cultural moments inspired me. Poem & Art Subject: The Gulf of Mexico oil spill. Poet Andy Young: Seeing both the art work and the other haiku, I realized how deeply the catalyzing event affected all of us. Poet Andy Young: The conversation speaks to a tough year, doesn’t it? To me, it also reflects a bigger conversation between the world and the individual, particularly as it is experienced through the body. I really like how the art work speaks to the bigger event and the individual poems speak to the particulars of how we feel it in our hearts, skin, lungs…I like that the final word of that conversation leaves us with a flickering light. Artist Cheryl Gross: I think the conversation should address 2010 as a year that left a terrible mark on the world. We have had a lot of disasters, some should have been avoided, others could have. We need to change our habits and ideas. Then perhaps, (hopefully that is), thing will start to reverse themselves. Poet Andy Young: I live in the Gulf South. There was no way I could see the BP oil disaster as some abstract headline. It’s right here. As a resident of New Orleans for the past thirteen years, I’ve been almost forced to find ways to articulate through my words what it feels like to be close to disaster. If I didn’t use the event as fuel, I’d be even more bewildered. Artist Cheryl Gross: Last summer I was with a friend at her house in Fire island. She had the TV on and watching an image of a pelican covered in oil, made me cringe. This was on CNN and the very same image was repeated to the point where I couldn’t watch anymore. I insisted we shut it off. The next day, the same footage. This went on for months, it was continuous to the point of nausea. Poet Marsh Moorhead: Baird’s “Spill,” although referencing the oil spill, also worked wonderfully, I thought, with my haiku. This was my favorite work of the four seasonal pieces. It was aquatic, disturbed, might be suggestive of a raft amidst turmoil. The unemployed, at sea, floating their summer and life upon a dubious raft of support, are, if effect, another kind of spill due to greed and inattention. Artist Kate Baird: Yes, because I’d been thinking about the oil spill when I made the image. And because I’d been focused on events—like, one-off current events. The oil spill was a long term “event” but unemployment is an even longer term one… so much so that I guess it became invisible to me, at least in thinking about this project. That said, I love the haiku and think it fits very well with the image. Poet Marsh Moorhead: I think the art helps to point out that a number of disasters are caused or exacerbated by the fact that we are not taking very good care of ourselves, the earth, each other. And in that way, the economic crisis, the oil spill, the unsafe conditions in the mines, and our inability to deal with natural disasters of all kinds as they arise are the result of the misguided priorities of profit and development above all else. Artist Kate Baird: Like the soundbite, the haiku kind of seems to lend itself to communicating either the very specific or the very general…not a lot of space to get into complexity or nuance or interrelation…so I think it becomes sort of a conversation of moments. It’s not a summing up or an overview of the year, and I think maybe it skews more towards what those events or stories which evoke emotional reactions. Poet Marsh Moorhead: Many events inspire me, and the haiku is the perfect form for expressing, in a nutshell, our response to the world around us. Additional note: As a serious student and practitioner of haiku, I found it interesting (and predictable) that most of the entries, and much of the voting favored the now-quite-out-of-date 17-syllable form. All the major haiku journals, as well as the Haiku Society of America have, for decades, favored a more concise, tidy form with fewer syllables. The classic Japanese haiku, when translated into English, are expressed as a subtle, one-breath utterance, comparing one image to another, or revealing an image transformed in some way. For this reason, I really liked the haiku about the moored boats swinging in the wind, reflecting the November elections. I suspect that this “syllable issue” gave rise to much animated discussion and a considerable amount of consternation on both sides of the fence among your readers around the world. By the way, Billy Collins, for one, still defends and writes haiku in 17 syllables, but really, really well! Artist Kate Baird: Before I went back and reviewed the headlines from the summer, when I tried to think about what had happened the oil spill blocked everything else out. Poem Subject: The vigils in response to homophobic crimes and gay suicides;rt Subject: The trapped Chilean miners. Poet Sam Ferrigno: Seeing the artwork did make me think my haiku in a different light. I thought immediately of how immense the impact of the spill was on the wildlife in the Gulf Coast and the people who relied on the Gulf as a means for living. If I had to connect that piece to my Haiku I would say that after Tyler Clementi committed suicide other suicides of gay men and women were put into light. It was like being able to see a spill that was already there. I had contemplated suicide because of my orientation when I was in middle school. Seeing the faces of all the people who didn’t make it stuck to my mind like oil. Poet Sam Ferrigno: All of the artwork posted for each of the seasons is excellent. They all seem to revolve around the oil spill, but even though they all depict the same event, they bring a unique perspective. The pieces for Summer and Fall even have similar subject matter—the natural sun contrasted with harsh chemical, yet they are totally different. I could go on about how the intricacies of each piece says something loudly about the spill but I don’t think I could tackle it in one question. They are well done because they say so much. Poet Sam Ferrigno: The event I wrote about is important to me because as a gay man I understand the desire to feel normal and the torment in feeling like it won’t ever happen. It sounds trivial, like something you would respond with saying, “Nobody’s normal! It’s great to be different!” but even when my parents assured me they would love me no matter what I was, I didn’t believe them and all I wanted was to be straight. It’s hard to accept yourself when you feel you won’t grow up like your role models and heros. Tyler Clementi should still be here so his loved ones could help alleviate the pain he was going through. Seeing so many people wear purple on that day in October,—in class, on TV, and at home was a huge assurance that there is support love here for people going through a hard time. NOTE: Inspired by Carrier’s Addresses and a deep commitment to public art, the HYIR is a special feature that debuted this year at Broadsided. Four artists created work in response to an event that for them dominated a season of 2010. We placed an open call for submissions of haiku that did the same. The art and the poems selected as finalists were posted online, and we asked you to vote on the winning combinations. Caleb Brown is an artist. He works on software interfaces and reads and walks and is going to make graphic novels someday. Or little dioramas. Or really big paintings. Or all of those things—and maybe this will be the year! He lives in Groton, MA with his wife, puppy and two tween twins, See more at www.caleb-brown.com. Poet Andy Young is the co-editor of Meena, a bilingual Arabic-English literary journal. Her poems and translations have appeared in Best New Poets 2009, Callaloo, and the Norton anthology Language for a New Century, as well as in a flamenco play, jewelry designs, and a tattoo parlor in Berlin. Poet Marsh Muirhead lives on the Mississippi River near Bemidji, Minnesota. His most recent poetry has been published in Rattle, The Ledge, and in Minnetonka Review.His haiku appear regularly in the English language journals and he is the author of Key West Explained—a guide for the traveler. Artist Kate Baird looks for the distances and differences between places through drawing and painting. She received an MFA from the University of Chicago in 2005 and currently works as a teaching artist at the Guggenheim Museum and the Kentler International Drawing Space. She lives in Brooklyn with her husband and daughter, and her work can be seen at www.katebairdart.com. Artist Jennifer Moses is a painter living in Boston. She is also a professor of art at the University of New Hampshire. She has exhibited her work throughout New England her most recent solo exhibition titled “A Line is a Straight Curve” was at the Kingston Gallery in Boston. www.jennifermosespainting.com.